$2,300.00 (1975) . . . The HP 117 VLF comparator was used to compare a house standard aginst the 60 kHz WWVB transmissions from Fort Collins CO. There is a loop antenna that has filtering to reject near by RTTY stations and amplification. The rack unit has a Tuned Radio Frequency (TRF) design, not a mixer type receiver. There is a meter and paper plotter to display and record the phase difference between the house standard and WWVB. There are two versions of the antenna, one uses 2 each 13CW4 Nuvistors and the other uses FETs. The 117A puts out 27 VDC on the antenna connector to power the remote active loop. The 35 VDC fuse blows if you short the Antenna connector. The Plot (DA100_28Jul01.tif ) is the output of the DA-100 active antenna with the control set for %) Ohms and 10 dB of attenuation, which is the position that the HP 117A likes the best, 0 dB overloads the 117A! This plot took just under 20 minutes to make becuuse the RBW & VBW were set to 1 Hz. This puts the noise floor at about -130 dBm. The broad peak to the right is the 100 kHz LORAN system with a peak at -92.2 dBm. The 68.55 kHz signal is my HP M70 monitor. The 60 Kc Test Output plot ( 117T60out.tif ) from 50 to 70 kC shows 60 kHz as the strongest signal, but the other stations are still there. I don't know how important this is. The front panel 100 kHz output ( 117out100kc.tif ) has the nearest sidebands (+ & - 120 Hz) down 20 dB and the frequency is right on. Connecting gound and center toghther does NOT work. The raw signal coming from the antenna has only a 10 dB signal to noise ratio. This is the active loop that's part of the Bob Roehrig, K9EUI WWVB 60 KHz frequency standard published in the Jan, Feb and March 1994 issues of 73 Magazine. Material 33 is a manganese-zinc material having low volume resistivity. Used for low frequency antennas in the 1 KHz to 1 MHz frequency range. Available in rod form only. The above part umber is for a 1/2" diameter by 7.5" long rod. FAR Circuits - has the 6 board set for the Bob Roehrig project . They also have article reprints. (2) as a source of amplitude modulated digital time code data to set a clock that includes leap years and leap second data. The leap second data is done with 2 bits in such a way that the clock can make the jump at the proper time. Starting in the 1990s there are a number of low cost clocks and watches that set themselves called "atomic clocks" based on this service. Note that GPS is a world wide system that does NOT have any leap year or second data. It does have a UTC to GPS time differential that will allow a clock to display the correct UTC time to within a second within about 12.5 minutes of the correct time to make the jump. GPS does not have any bits for DST. I bought the HP 117A <117A.shtml> VLF Comparator from EIP Microwave since they had replaced it with a Loran-C based system. It uses Nuvistors in the loop antenna and the 60 kHz amplifier block that are hard to find. I have replaced them and now it works well. I would like to use a PIC microcontroller to decode the time signal. The stock unit only looks at the phase difference between the external signal and the phase of WWVB. You can see the hourly 45 degree phase shifts on the WWVB carrier as well as the dinural variation in phase of the signal from WWVB. Note that WWVB is in the process of increasing their power. Looking for a source of contact type strip chart paper: width = 2 1/2", plot width = 1 15/16", sprocket holes on both sides of paper = 0.1 ID on one side and slots 0.1 x 0.15" with a 1/4" c-c pitch. along the edge is says: HEWLETT-PACKARD RECORDING CHART NO. 9281-0081 Example plot showing adjustments being made to an HP 107 oscillator. You can see the hourly phase shifts on the WWVB carrier. The strip chart drive in the 117 may be the same as an Amprobe model DB81 that uses Amprobe model 850D chart paper. NIST is increasing the power of their time station WWVB on 60 kHz so that the East coast of the U.S. will have a stronger signal all year. There are other time stations in England MSF 60 kHz , GermanyDCF77 77.5 KhZ, and Japan JG2AS 40 kHz. to the low frequency time signals of most countries and need to be coupled with a microcontroller to decode the digital output into time information. They have changed their web page and I can no longer find information on the U 4223 B-CFS. It is packaged in an SSO20 surface mount package, the only other version is a raw chip. The SSO20 package has 0.025" pitch connections which is 4 times closer than a DIP with 0.1" pitch. So far this has been a problem in building a prototype. A Radio-controlled Digital Clock - PIC based with LCD display Elmer's Guide to Atomic Clocks for the Home and Office - Klockit - sells a movement to drive conventional hands. This ships with a pin to lock the hands than must not be removed until it is installed and the hands attached. I used one to convert a Wal-Mart clock to WWVB controlled. (You might look for an ALL plastic clock for better reception.) Klockit now has a complete kit in addition to the movement. When I built mine I needed to order the second hand separately, be sure to get all three hands with the raw movement. B Roehrig, "Most Accurate Frequency Standard, Parts 1,2,3", 73 magazine , Jan/Feb/Mar 1994.Circuit boards available from FAR Circuits This is a frequency standard and needs additional circuitry to demodulate and decode the time signals. UL333 Antenna & RF decoder , Data Decoder & Display it's now a UTC only time display, but might have be upgradable to local time Radio Shack's Radio Controlled Clock to SDR Interface - info on Blob cable Agilent 4395A <4395A.shtml> - If an active external antenna like the Dymec DA-100, that can pick up the 60 kHz signal from WWVB is connected and the center frequency is set to 60 kHz, span to 100 Hz, RBW to 100 Hz, then the sweep time is 45.71 ms. The display jumps up and down 10 dB in step with the time code modulation on WWVB. The number of points is set automatically to 5. 4395A Spectrum Plot 50 to 150 kHz . The triangular peak centered on 100 kHz is LORAN-C.
Radio Clock - a PC sound card based software package that decodes the audio WWVB signal from your receiver and sets the PC clock. Made to support BeaconSee for ham radio propagation monitoring. They also have a free applet for GPS PC clock synch. 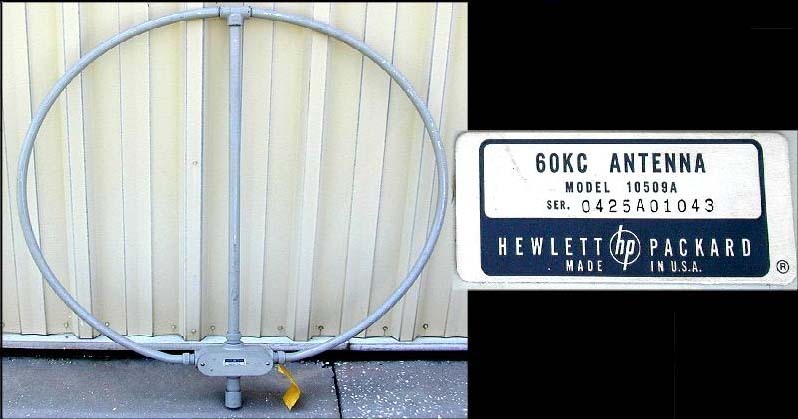 Subj: Re: 60khz Antenna Posted by bill bastian on March 18, 2001 at 17:05:25: there is a build your own antenna,which with modification tothe hp117a works just fine. it was in 73 amateur radio january, feb ruary and march 1994. covered building everything fromthe antenna to the comparator. i picked up a used hp-117a, put a voltage regulator at the 35 volt input to the preamp to swampit down to 12 volts, and a resistor, and hooked up the ferrite bar antenna built from the plans in the article. works just fine. there is a commercial antenna available,which with a capacitor in the feedline, will work just fine with the hp-117a. i can get you the details if you need them. expensive-several hundred dollars for it. building your own is under $50. give me a snail mail and i can send you a copy of the article you can build it from. pc boards are available from FAR Circuits also you can get me on telephone evenings/weekends at 608-372 7293.